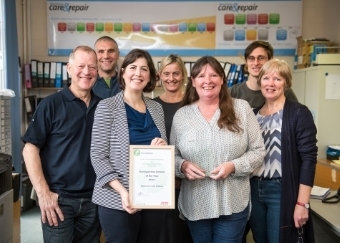 Care and Repair exists primarily to meet the needs of older or disabled homeowners and to support all older and disabled people in living independently in their own home. Older homeowners are most likely to live in unfit housing yet, if they are receiving income support, there is no element to cover repair and maintenance. The health impact of cold, damp and unfit homes on older people is considerable and the disruption of a move, even if possible, may not be beneficial. While our services are tailored to each borough in which we work, we offer these main services under the broad description of Home Improvement Agency (HIA). This service helps older or disabled householders with major property repairs and improvements. We assist with work planning, recommending a reliable contractor and access to subsidised loans from the council or alternative financial assistance. We can give the names of reputable contractors to residents who then manage the works themselves. This service is only available in Manchester. This service meets the needs of any older person for small DIY jobs that they can no longer carry out themselves such as changing light-bulbs, dripping taps, sticking doors, and fitting of grab-rails, key-safes, draught-proofing and small joinery work. This service is available free to anyone aged 60 or over in Manchester. This gives that extra help to people, often owner-occupiers, who need guidance to find the services they need to remain independent in their own home. We help them to navigate confusing eligibility criteria, fill in complex forms, apply for welfare benefits or charitable support and reduce isolation by linking to local groups and activities. We offer a helping hand to all those over-60s who are discharged from one of the three Manchester hospitals. Our friendly staff aim to ring you within 24 hours of discharge and offer a range of support services to help smooth the transition from hospital to home. In addition, at North Manchester General Hospital and Manchester Royal Infirmary we provide an Assisted Discharge Support service to help vulnerable or isolated patients prior to discharge and provide personalised support so they are prepared, transported and settled back into their home. The current services and eligibility criteria are described under Manchester Care & Repair and Wigan Borough Care & Repair.